A project at my sorta new job required some on-site work, thus providing me the opportunity to engage in one of my favorite pastimes: travelling to and exploring new places, adventure style. And on mostly someone else's dime! This time it was to Singapore, a small island nation at the tip of the Malay Peninsula. This place is about half the size of Oahu and all flatland with a population of 5 million. Different parts of the city have completely different characters, almost like going to different countries: The Arab quarter with tranquil streets and a Mosque, Little India that's like what I imagine what (big) India is like, Orchard Road with and endless procession of department stores and Gucci kind of places, the waterfront gambling palaces that are being built, a Chinatown that looks like no other Chinatown I have ever seen, and the district that I stayed in called Geylang - a nocturnal, multi-ethnic area with hundreds of street restaurants all of which seems to be closed during daylight hours. Work was just ... work. Need I say more? For a week and a half I took the train to the other side of the island (yes, they have a real public transportation system there that actually works efficiently), and then explored here and there after work. They take their laws pretty seriously over there so you won't find any low-lifes hanging around looking for stuff to steal and drug trafficking carries the death penalty - so it comes as no surprise that something as powerful as Skyalis is not to be found here. I suppose the lack of mountains and places big enough to land in that have not been developed might have something to do with it as well. But wait - you can literally swim to Indonesia from here, and Indonesia does have mountains! A much easier way is to just get on a plane and fly there. My work had gone well and got almost all of it done in one week. I just needed a couple more hours to double-check some things and then I was itching to jump on a plane and fly a couple of hours to the island of Bali. Alas, Monday was a holiday - not in Asia as it would be silly to honor some guy that was going to go on a little sail to Asia and then couldn't find it! Too bad the US Navy thinks otherwise and closed up for the day. So I cooled my jets for another day and then finally arrived in Bali Wednesday afternoon, and the taxi ride from the airport gave me a taste of what was in store for me: the basic family car in Bali is a 125cc scooter, and they outnumber the four-wheel kinds of cars 2 to 1. I saw families of five on a scooter, more stuff than I can fit in my Prius piled onto a scooter, girls wearing the very beautiful traditional sarongs sitting side-saddle on the back of a scooter, and even a dozen live chickens on a scooter. They drive on the left side over there... most of the time, and the lines painted on the road are only for decoration as they mean absolutely nothing. The rule is to drive on the pavement wherever there is enough space for two nickles, and if that's not good enough, then you drive where there is no immoveable object in the way. After checking into a place to stay, I went out and changed 100 US dollars, became an instant millionaire, and then searched for a motorcycle to rent. Of course, I came to find out that it was the first day of Galungan, a Hindu festival celebrating ancestral spirits that happens every 210 days, thus most of the shops were closed. Fortunately, a mighty ancestral spirit is a fifty thousand Rupiah bill (about $5) and it got me one of those scooters for a day. You only need to ask a Balinese where you can buy or rent something and it magically appears from some dark corner. Had a few hours of sunlight left, so I strapped on my new reversible harness with glider and headed out to see if I could find the local PG launch. I had bought a map, but it was totally useless, and I went with only a vague idea of where it was. First I joined the meele on some major roads - kinda like playing a video game run amok with no "new game" button, then into an expensive resort area with immaculate streets and landscaping that then deteriorated more and more the further I got from the resort, eventually becoming a dirt road running somewhat inland of the coast. I finally ended up in a development being constructed across a ravine from a place that looked like it might be a paraglider launch site. Fortunately, one of the workers there recognized the pack I was carrying and pointed somewhere where I presumed I could circumnavigate that ravine. After putting around a bit, I found myself looking down something like a goat trail, thinking: this can't be right! But then I spy another moped coming up the trail, and the guy on it is carrying a glider bag! Turns out this guy's name is Ketut, one of the longtime local pilots that was there way back when Jimmy Hall shot his epic "Bali High" video at this same site. Soon I was at the launch, just as a visiting Swiss pilot was leaving muttering about it being no good and too cross. I then saw a couple of Brazilian pilots returning from somewhere down the coast. The cliffs go for about 11 kilometers in that direction, but to get there you have to cross the aforementioned ravine which supposedly generates a nasty rotor when the wind is cross like it was when I got there. Not to be deterred, I broke out the glider just to see if I could kite it. Despite being light (about 7 mph) and cross, I was airborne long before I even got near the cliff face. Who was I to complain? Flew about an hour watching the sunset - Awesome! The terrain is a lot drier than I expected and was very much like flying Southern California coastal sites like Torrey Pines, Bates, or the Wicox in Santa Barbara. After a delicious $3 dinner of unknown ingredients, a $1.50 breakfast of similarly unknown ingredients, I extended my rental of the scooter for a few more days and headed up the melee on the road to see what I would find. After a while I came across a fellow sitting on a rare section of sidewalk next to a pile of Durian. These are fruit about the size of a football with a spiky shell that can be split into several wedges that separate a number of date sized seeds which are surrounded by the meat of the fruit. It is creamy custard-like, sweet avocado-like stuff with a unique taste all its own that is really delicious. The only problem is that the fruit has the most awful smell of anything you can find including that stinky French cheese, or maybe Reapers old socks... I decided this was what I was meant to find that day, bought a few and returned to my room to devour one and then head out for some more flying at the Timbis Launch. Made a few flights in really light and again cross conditions where one screw-up would drop you out of the lift band and banish you to the beach below, and then talked some to some locals that have sort of set up shop out there making a living off of visiting pilots. They seem to be out there every day and haul out beers, sodas, water, and snacks (on scooters of course) that they sell for not much more than you pay for it in town. The local brew, Bintang, goes for $2 a bottle. There are others that wait around to fold your glider for you - $2, or if you bomb out to the beach, they'll come get you for $5 - on a scooter of course. Later in the day, Ketut returned to show his stuff: He took a couple of tourists tandem in those same light cross conditions and used an interesting tandem launch technique: He'll hook himself in, pull up the glider and then kite it as a couple helpers hook in the passenger. After the flight he'll top-land, the helpers unhook the passenger and hook in the next one as he is kiting. Pretty slick! The next day was reserved for some sightseeing and I put about 450 kilometers on the scooter riding up over the middle of the island and back along the coast. I visited Ubud, a spot about 30 kilometers inland that I did not care for as it is now totally overrun by trinket buying tourists. It's one redeeming attraction was the "monkey forest" - a Hindu temple in the jungle that has a pretty good sized population of macaque monkeys that live there and are really entertaining to watch. Not very shy either, as one of the juveniles saw me sitting on a rock, scampered on over, jumped up and sat on my knees as he grabbed the lens of the camera I was holding in his little hands and then peered into the lens! Further riding brought me past Mt. Batur, the sometimes active volcano also featured in Jimmy's video, and then along some beautiful coastline, especially around a town called Candidasa that is also supposed to have a small launch in the mountains above it. In no time at all it was Saturday, my last day, where I went out to another Hindu temple in Uluwatu, perched high on a cliff above the ocean on the same part of the island as the Timbis Launch sits. This one also has a colony of monkeys and was situated perfectly for the again cross winds that day. I doubt it would be appropriate to launch from the temple, but there was plenty of open land around it. Takes bigger cojones than I've got to launch there as these cliffs are about 900 ft. sheer vertical going straight into the pounding waves. No little "possible bailouts" below, no sidehills, and no way back up. This place may be a no-go, but from the looks of it, I'm sure there are many other great flying sites on this island yet to be pioneered. After my visit to the temple, I went to Timbis for a last flight, but was disappointed to see it even lighter and still cross. Figured I'd hang around for an hour and a half till 2:00 when past experience at other sites like this has shown that 2:00 is usually the strongest it will get in a day. Kited a bit, but didn't feel inspired, then watched a visiting Japanese pilot launch and give it a valiant attempt only to succomb to the inevitable clutches of the beach below. 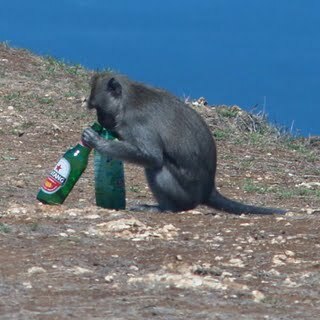 I discovered that Timbis launch had its own troop of about 20 or so monkeys that are much more shy that the temple monkeys, but these have acquired a taste for beer. At 2:00 it did indeed get a bit stronger and even a bit straighter in and I found, to my delight, that it was easy to stay up and I had the place all to myself and the monkeys scampering around the bushes below. People must have been watching through telescopes, because before too long pilots started materializing on launch out of thin air! Things got a bit crowded, especially with three tandems in the air with their massive wakes, but then conditions got even better with the appearence of a few light thermals here and there. I really like tickling those light thermals, and soon it was very satisfying to be able to pilot my lowly 1-2 glider well above the traffic and keep it there. And above me was only blue sky... not Alex's glider or bare feet that are usually up there! Click on picture to see a rather jumbled slideshow! Great story and pictures, Berndt - I felt like I was there with you! You are a rather prolific story teller. I agree with Alex, I felt as though I was traveling with you. My sister has visited Bali and said the little devil monkeys tried to steal her glasses. Sounds as though you had a good time. Thank you for the adventure. What a way to start the morning, I feel like a trip to Bali may be in order. Great right up, glad you were able to mix business with some Monkey business. See you back in the air. Thanks for Sharing. Great stuff Berndt, I miss the place. Myself and my non-flying (meaning surfing) have a long history on the Bukit Peninsula. I have buddies who actually live there and could have picked you up, but then you'd miss some of the adventure. Believe it or not there is actually a method to the madness on the roads, and once you figure it out it pretty cool. Having said that, life can be pretty cheap on the roads and for $40 you can accidently cripple someone and the cop will let you drive off (wasn't me). Never the less, I had my first tandem in '99 with Ketut. I also met Jimmy, Stephanie and Gabe Jebb when they were shooting Bali High at Timbus. It is a great place to learn to fly, and the 10k flight to Uluwatu Temple has to be one of the most scenic ridge rides around. Great story Berndt! Thanks for sharing. Awesome story and great pics Berndt! I'm very jealous. One of the most attractive things for Oahu pilots is to fly by the Timbus launch and yell, " satu lagi" and one of the cooler toting ladies will hand you a cold Bintang beer in flight. It is worth it just for that alone. Sick story Berndt! I wasn't flying yet when I went to Bali and Singapore and if I go again I'm bringing a glider. Great story Berndt - I'm jealous like McStalker. Nice story Berndt! You really captured the moment. Made me look up prices to Bali ($795) Hehe. Great story Berndt! I really enjoyed the photo journalism! Someday I will go and check out those monkeys for myself! Welcome back! Looks like they have a nice PG launch downslope from their HG ramps.